This activity center in Abhiramapuram was made for both children and adults, and has a bunch of activities to do. Utopia World is an activity center in Abhiramapuram, meant for both children and adults who are kids at heart. They have a range of facilities and activities to take part in with the overall theme being, to make parenting easier. 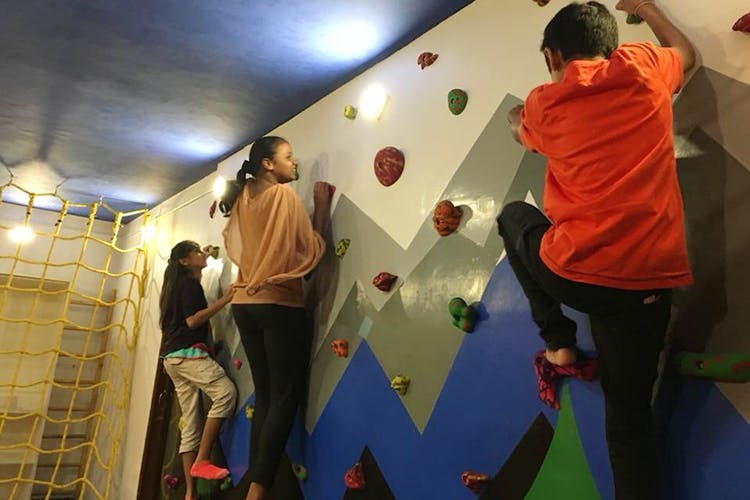 For children there are play areas with ball pits, bouncing castles and toys, art corners where you can paint and draw, a gym with a climbing wall, monkey bars and rope climbing stations, and a learning room with books for kids. Adults have slightly less variety but that’s okay because we think it’s pretty cool that there’s a fully equipped movie/karaoke room, a gymnasium for adults with fitness classes, a library and a café/patisserie. The in-house café is powered by Boganvila Patisserie and Café in Velachery and has plenty of cakes, pastries and savoury treats too. In fact Utopia World partners with a few other organisations in the city, like Mom and Me and Flabfit to host events and run workshops at their venue. There are workshops like fitness for kids where kids are allowed to play through movement and simultaneously fitness classes like Crossfit for adults as well. So parents can spend time doing things for themselves while also letting their children grow. Utopia World also has facilities to host group events, like birthday parties and corporate get-togethers as well. Right from food to projectors their team will handle all your venue related troubles. Pricing for their services comes in three forms, hourly pricing for use of spaces like the play area for kids and movie/karaoke room (approx. INR 150/hour), subscription pricing for continued use of their service and a separate pricing for events. We think their movie room is particularly cool because of the movie marathons and the popular movies they screen in both regional languages and English (LOTR marathon, anyone?). All in all there’s plenty to do and see here for parents and non-parents (kids too! ), so be sure to check them out next time you’re passing through RA Puram. Having spoken a great deal about parents and how Utopia World is meant for them, do note that all their facilities for adults are open to all adults, so you don’t need to be a parent to watch a movie or use their Karaoke room.